Smithwick's Atlantic Blonde Ale - Oak Beverages Inc.
A crisp session ale, brewed with polaris hops for a sunlit golden taste, citrus aroma and moreish malty flavour. 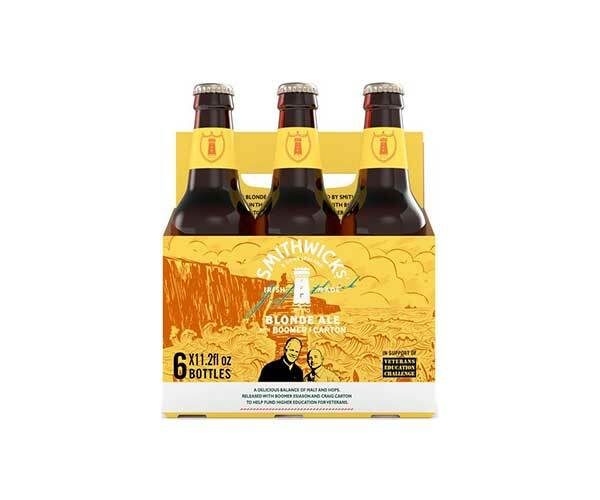 Smithwick’s Atlantic Blonde Ale captures the bright, bracing days of Ireland’s west coast. With its balance of polaris hops, citrus fruits and moreish malty flavour it’s a great thirst-quenching ale to enjoy while watching the sun go down. SMITHWICK’S IRISH ALES, BREWED WITH OUR PASSION, HARVESTED FROM OUR LAND, SEASONED BY OUR HISTORY. IRISH MADE SINCE 1710. After the War business was looking good, then in 1947 melting snows caused a major flood, submerging the entire brewery. Luckily all the precious recipes and technical reports were safely stored high on the third floor. In no time the brewery was back in action but the summer that followed was the worst on record. Heavy rains caused a national emergency, threatening cereal crops. Disaster was avoided and the nation was saved from a minor famine and a major lack of great ale.